Vista Turf is proud to serve the community of Grand Prairie with professional lawn care and pest control services. For more information or to get a free quote call us today at 817-307-0583. 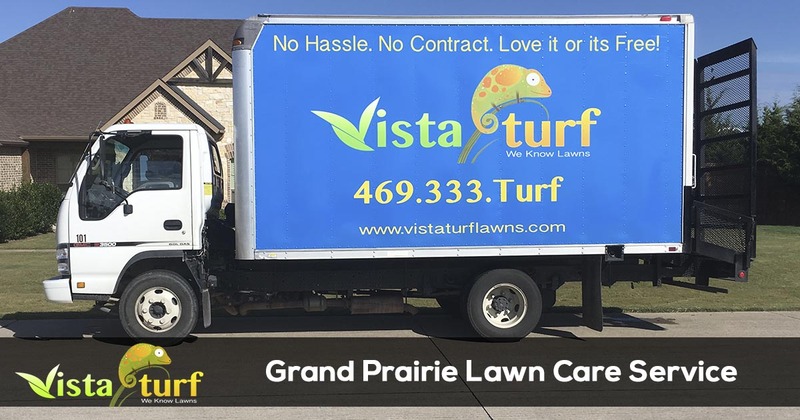 Since 2008, Vista Turf has been committed to providing businesses and homeowners with the best lawn care service in Grand Prairie. We offer a 100% satisfaction guarantee on all of the services we provide, so there is no risk in trying our services. We are licensed and insured professionals that have the experience, knowledge, and tools necessary to take care of all your lawn care and pest control needs. Whether you enjoy spending time out on Mountain Creek Lake, going to the Epic Waters Indoor Park or going to the #1 farmers market in the State of Texas there is always something better to do in Grand Prairie than taking care of the yard at your home or business. At Vista Turf, we know lawns and you can trust us to properly care for your lawn and landscape just like so many of your neighbors. At Vista Turf, we provide services that make having a beautiful lawn easy. Our mowing, landscape, fertilization and weed control programs take the current water restrictions for Grand Prairie into account. And our irrigation and sprinkler system services will keep your sprinkler system operating properly while conserving water. We even make the outdoors enjoyable with our outdoor pest control and mosquito services. Vista Turf is the industry leader for lawn care and pest control in Grand Prairie. We offer a money back 100% satisfaction guarantee with all of our services, so there is no risk for you to give us a try. Give us a call today for the fastest service at 817-307-0583.